TPU received pictures of XFX's new Radeon HD 7870 Double Dissipation graphics card, it features the same cooler as on the Double Dissipation Radeon HD 7900 series products. The Double Dissipation cooler uses an aluminum fin stack to which heat is conveyed by copper heat-pipes, which draw heat directly from the GPU die. The fin-stack is then ventilated by two "GHOST" fans, which are whisper-quiet. The R7870 DD from XFX also features a 5-10% factory-overclock. 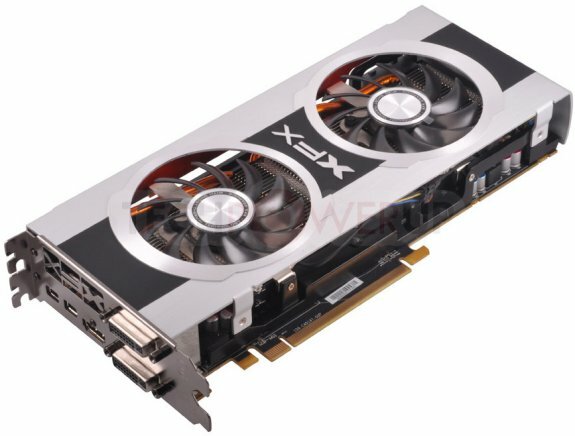 Slated for market-availability on, March 19 like the rest of the Radeon HD 7800 series products launched today, the XFX HD 7870 Double Dissipation will charge a small premium over the reference design.